It just didn’t get any more Scandinavian here in Minnesota than during this weekend in Minneapolis, at the City of Lake Loppet Festival – the urban cross country ski festival — with perfect winter weather, clear blue skies, a warming sun, deep snow, and with over 10,000 cross country skiers of all ages on perfectly groomed trails racing through the city, from park to park, from lake to lake, to the welcoming finish line at Lake Calhoun. 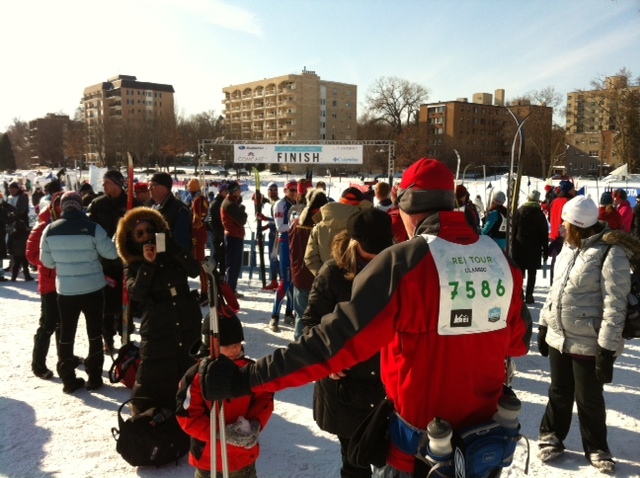 There, among all the spectators, former long-time Minneapolis mayor R.T Rybak and one of the founders of this over decade old tradition applauded the arrivals, whether they had just completed 10 kilometers or a marathon at 42 kilometers. 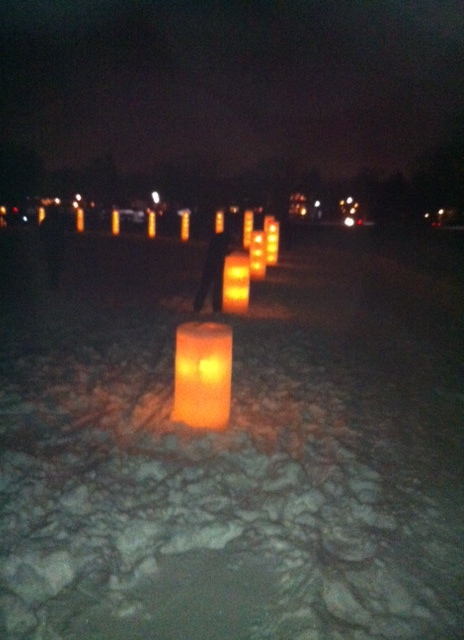 Rybak, himself, started off the Luminary Loppet (by the way, “Loppet” is Swedish and means the race) on Saturday night on trails lightened by hundreds, if not thousands, of ice lanterns. 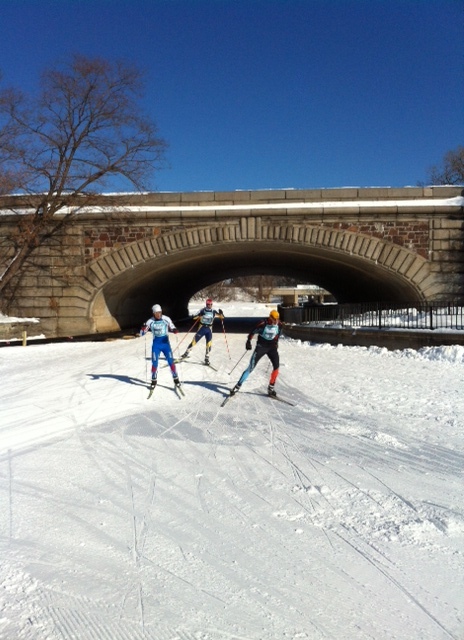 The Luminary Loppet was sold out — 7,000 participants — one of 21 events, which included dog sledding, a snow sculpture contest, ice-bike racing, and more. 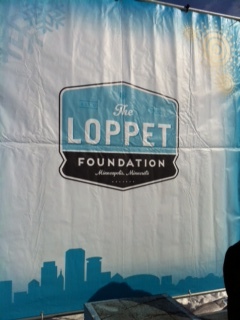 All funds from all the racing fees go to the non-profit Loppet Foundation’s youth activities, encouraging skiing and other outdoor activities among, so far, 6,500 children in the North Minneapolis schools. The night was cold and all the stars were out night during the Luminary Loppet with ice lanterns showing the way as the thousands of skiers went around the lake, stopping now and then to taste the hot chocolate distributed by hundreds of volunteers by the warming bonfires on the frozen Lake of the Isles. It was all pretty special, especially for a Swede who grew up skiing in the old country and whose father lived and loved this sport more than anything — the best form of exercise in the world, he used to say. I remember going with him to Swedish cross country championships and the World Championships in Falun way back in 1954, when it was minus 20 (Celsius) and a skier named Vladimir Kusin from the Soviet Union won two gold medals. My father skied until he was almost 90 years old, and my older brother successfully finished the classic 90 kilometer long Vasaloppet in Mora in Dalarna, the mecca of Swedish cross country skiing. They would have loved this past weekend in Minneapolis just as much as I did. I only regret I didn’t bring my skis. Next year, maybe! Obama won the last debate but will it matter? And so the last of the four TV-debates in the presidential election campaign is over and in only two weeks, America will choose a new president. The debates have played an important role in this campaign, more important, perhaps, than in many a year, maybe since John F Kennedy met Richard Nixon in the very first debate in 1960 and upset the favorite, the sitting vice president. In the first debate in this year’s campaign, the challenger Mitt Romney knocked the socks off a sleepy Barack Obama and became a serious challenger to the president. Obama’s listless performance let Romney into the race, a race that the president at that time led comfortably. And then, Romney held his ground pretty well, although the judgment is that Obama won the two following debates –last night’s by 48 percent to 40, according to CNN’s first quick poll, and by 53 percent to 23 according to CBS News. Still, it was a fairly even debate where neither candidate committed any major mistakes. In fact, you could argue that there was no real debate, for Romney had decided to hold back, lie low, be cautious, and be presidential, or something. All his earlier criticism of Obama’s foreign policy was gone, replaced by broad consensus between the two about America’s role in the world and president Obama’s foreign policy. On Iran, Syria, Afghanistan, the war on terror including the drone attacks against terrorists in various countries, and, yes, even on Libya, Romney took positions very close to Obama’s. By refraining from attacking Obama, Romney had clearly made a decision not to seem like a war hawk, not to seem belligerent and someone seeking new conflicts and new wars for America in the Middle East. By doing so, he moved towards the political center, towards a more moderate policy – he became a “man of peace,” as someone said, probably jokingly, afterwards. Why the subdued, cautious Romney? Was he playing it safe in a race that now seemed more even than ever? Maybe. But as a result, he came to stand in stark contrast to a firm, straight talking, decisive president, who said he had done what he promised to do when he became president, and that he was the best one to lead America in the next four years. Will what happened in this final debate matter? We don’t know yet. The two previous debates between Obama and Romney had each been watched by almost 70 million people. Last night’s debate most likely had fewer viewers. Foreign policy is not the main theme of this campaign. And most voters seem to have made up their minds by now. The number of undecided are very few and the remaining two weeks of the campaign will be more about getting out the vote — turnout can decide this election, which is so crucial for America and this country’s future. Home again in Washington, DC after two weeks in the Nordic countries, Sweden, Denmark and Iceland, primarily to participate in the publication on September 20 of my book “Amerika – drömmarnas land” (America – country of dreams) in Stockholm. Nice book release party at the Dance Museum in Stockholm with many old friends, a book discussion at the ABF educational association with journalist colleague Stig Fredrikson, a lengthy interview on the Knowledge Channel about the book. The American election campaign is the center of attention in the Swedish newspapers and on radio and television. The coverage is amazingly extensive. On the way back home, a short visit with good friends in Reykjavik and a lunch seminar at the Icelandic Foreign Ministry about my book and the U.S. elections. Lively and fun! The return home came just in time for today’s big event, the first of three televised debates between President Barack Obama and his Republican challenger Mitt Romney. But before that, I will also head to the ballpark to cheer on my Washington Nationals on the last day of the regular season for winning the National League Eastern Division and for taking the local baseball team to the playoffs for the first time since 1933! Tonight then, in Denver, Colorado? I remember the first TV debate ever, in the autumn of 1960, between John F. Kennedy and Richard Nixon, shortly after I arrived in the U.S. for the first time. JFK won the debate and he won the election, albeit with the slimmest of margins. Ever since then, the importance of these debates has been discussed. The conclusion? Not unanimous. Sometimes, as in 1980 when Ronald Reagan faced Jimmy Carter, Reagan came out on top and then won the election. Sometimes, as in 2004, John Kerry won dthe debate but George W. Bush the election. And last time, in 2008, the debate winner, Barack Obama, also won the election. The Washington Post summarizes the situation ahead of tonight’s debate. A few weeks ago, I wrote on this blog that something had happened after the two party conventions but that I did not want to call it a turning point in the campaign. Since then, the situation for Mitt Romney through a series of mistakes, especially his talk about America’s “47 percent,” has steadily weakened. And now the conclusion is inescapable: we have reached a turning point. Obama has strengthened his position on a wide front and time is running out for Romney. To reverse this trend, Romney tonight needs not just to have a major breakthrough, but he also needs a major mistake, a major gaffe, by Obama. That is unlikely to happen. I went to a big time soccer game last night, of which there are not, alas, many on a regular basis in America. 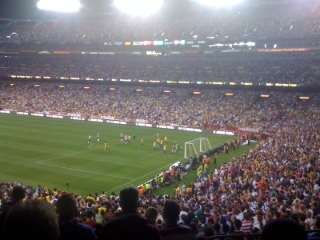 I was there, at FedEx Field where the Washington Redskins usually rule, with 67,000 other people, including an American friend, who had not seen much soccer before last night, but who came home a fan. How could he not be? The evening was soft, the atmosphere exciting, joyous and friendly. In the stands were Americans, Brazilians, Latinos, soccer moms and soccer dads with their sons and daughters, coaches with their young players. In 90 minutes, it was all done — not an eternally long, and constantly interrupted game, like in baseball or American football. Yes, Brazil beat the United States, 4 -1, what else is new? Brazil is just the best, and the American side was never close to winning. It seemed, in fact, that in spite of all their big game experience with the national team around the world, and with their clubs in Britain, Italy, Germany, Portugal, Holland, the Americans were intimidated by their opponents, at least in the first half. They lacked resoluteness, speed, toughness, even energy. But it was a glorious evening anyway, a big night for American soccer. As this sport continues to grow in this country, I have no doubt that the United States will be a true power house in the world’s biggest sport. Want to read more? Here is Sam Borden’s excellent piece in today’s New York Times. Go Caps — Go Sweden! Tonight, the National Hockey League’s playoff for the Stanley Cup starts for me, with my home team, the Washington Capitals, facing the Boston Bruins in Boston. Like millions of NHL fans around the world, I have two loyalties: the team itself and those team members from my home country. In my case, they are Nicklas Backstrom and Marcus Johansson, two of a total of 59 Swedes all around the NHL — more, even, than the Russians (42), Czechs (40), Finns (21), Slovaks (10) and the handful of German speakers. Yes, the Canadians and the Americans still dominate – you only hear two national anthems before each game – but the internationalization of the National Hockey League is a fact and in full view on its website, the only truly multilingual site of any major sport, with eight language versions: English, French, Russian, Swedish, Finnish, Czech, Slovak, and German. The Major League Baseball website has only three foreign languages, Spanish, Japanese and Korean, while the National Basketball Association, with its huge international following and all the players from Europe, Latin America, and Asia, is only in English. Now, Sweden has only one player in the NBA, Jonas Jerebko of the Detroit Pistons, so I can understand the lack of a Swedish language site, but come on…Spanish, Chinese, Serbian, Croatian, Russian, Turkish, German. We all really wish our country men to do well, so now you understand: Go Caps — Go Sweden! The Clint Eastwood television ad during the Super Bowl last night about Detroit and Chrysler and the U.S. automotive industry’s strong comeback has created quite a stir, both in the ad world and in election politics. The two-minute long ad, “Halftime in America” is very similar to the Chrysler ad with Eminem during last year’s Super Bowl. It is also similar to the classic TV ad from 1984, “Morning in America”, about Ronald Reagan. Republican strategist Karl Rove is upset while liberal bloggers are delighted and claim that “Eastwood made Obama’s day”. Is “Halftime in America” political advertising? Can it be seen as endorsing President Obama and, indirectly, his actions that saved Detroit’s car industry? Obama and his name are never mentioned in ”Halftime in America”, and Eastwood, a republican or rather a libertarian, is not talking, at least not yet. Myself, I’m not sure. Calling it an endorsement for Obama is probably reading too much into it. But take a look and judge for yourselves! Tonight is friendly game of soccer, but it’s not any friendly, and maybe it won’t be very friendly … that is at least what the 82,000 in sold-out FedEx Field just outside Washington DC are hoping. Barcelona against Manchester United. The world’s two soccer clubs meet again after the final of the Champions League in May, when Barcelona was clearly the superior team. Maybe Manchester is thirsting for revenge, and perhaps there is a chance now when Lionel Messi — “The Boy Genius” — still has the summer off after a busy international match schedule. The sold-out FedEx Field underscores the huge business interests of both clubs here in the United States, where they have millions of fans which they want to retain and build upon, as soccer continues to grow in interest and importance even though American football, baseball, basketball, and ice hockey all are still more popular. The big soccer news here is otherwise that former German star player and coach, Juergen Klinsmann, has been put in charge of the U.S. national soccer team. He is taking over from Bob Bradley, who was fired last week after two big disappointments: the U.S. loss to Ghana in last year’s World Cup and this year’s loss in the Gold Cup final against Mexico by 2-4, after leading 2-0. America’s soccer federation has tried several times before to land the now 47-year-old Klinsmann, who lives in Southern California and is married to an American. George Vecsey gives a good insight in today’s New York Times as to what challenges Klinsmann will be facing in his new job.